AUROLECTROLESS™ SMT is an immersion process designed to produce solderable, uniform fine-grained deposits of soft, pure gold on metallic substrates such as copper, nickel and palladium. 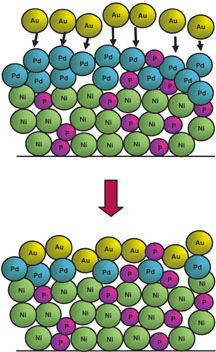 The immersion gold process is typically the last operation in building a printed circuit board and therefore the quality of deposit and process yield are very important. Dow Electronic Materials has developed immersion gold process technology that provides an easy to use, high and consistent quality solderable finish for the most demanding printed circuit designs.